For some reason, I thought I had missed a day. In the middle of all the chaos I had prepared a brief apology, blaming my job-searching and the incredibly ridiculous barking coming from the pack of wolves next door. Or maybe they’re dachshunds. Regardless, they’re loud and the only solace I find right now is in how equally loud my Beats speakers can blast Deadmau5. Moore. The only photos I really felt showed the destruction of May 20th was the destruction itself. My tornado video and photos were sub-par, as within minutes of the entire scenario unfolding, I had thrown my camera down and was frantically trying to flag traffic out of the way. I’ll never forget it. 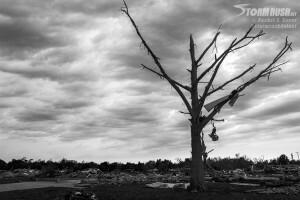 What I have today is one of my “favorite” photos, showing the damage, the twisted tree…and the shocking lack of housing. I promise to post something a little more uplifting tomorrow.